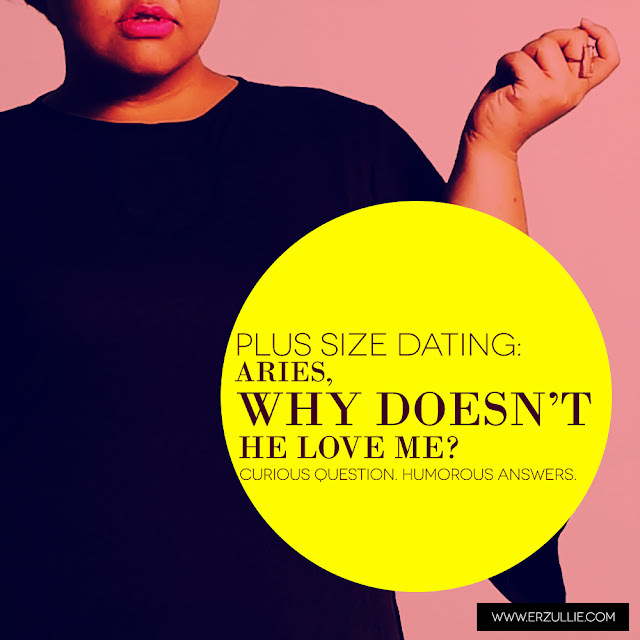 Erzullie Fierce Plus Size Fashion Philippines: PLUS SIZE DATING: ARIES, WHY DOESN’T HE LOVE ME? PLUS SIZE DATING: ARIES, WHY DOESN’T HE LOVE ME? I have watched this little movie gem before --- “Bakit di ka crush ng crush mo?” (Why are you not a crush of your crush?) --- it was based on the book of the same name by a brilliant writer/comedian Raymond Bautista. Although of course, book is always better than movie (at least for me), I would also like to answer that question, but fashioning it to a more Erzulliesta tone --- Aries, why doesn’t he love me? #1 Does he even know you exist? I mean how can you expect a guy to notice you, if he doesn’t even know you are there? #2 Are you even ready for what you are asking for? Oh so many times I have seen this happen to some of my women (or women that my women knew --- you get the point). They are all for this guy and they even made the first move. Then the guy starts to participate in the love tango and what do they do? They bail out. Yes. You read it right, ladies. These women --- bail out. They start freaking out. They start overthinking. They start losing it. They start acting weird and not themselves just to keep the guy. And guess what? Guy gets weirded out. Gets turned off. Moves away. Then what? Girl is left crying. Girls move in for the comfort --- let the healing begin. After that? Another guy comes by. Girl gets excited. Let’s do the ride again. It’s a cycle. It’s a weird, somehow psychotic cycle that some women go for. Let’s break that. How? Let’s reflect --- do I really want to have a relationship right now or just the kilig factor? (kilig = feeling love factor) Because if you are looking for some romantic drama in your life, let’s just pop on a DVD and have fun girly time with our other women. #3 Because he just doesn’t and there is ABSOLUTELY nothing wrong with that. Whatever his reason would be --- he likes this. He loves that. He wants this. He wants that. Things like this. It doesn’t matter. BOTTOM OF THE ISSUE? He just doesn’t like you because he said so. Sure, you will feel rejected. But believe me, there is nothing wrong with you. There is nothing wrong with him either. It’s just that YOU and HIM are not meant to be together. Better news? Your guy is out there. Drop this guy and be open for the new one.